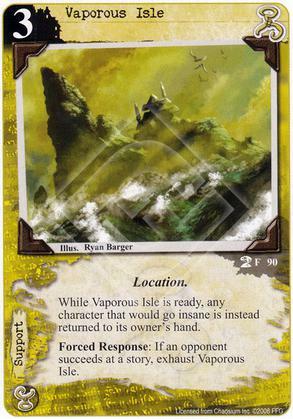 While Vaporous Isle is ready, any character that would go insane is instead returned to its owner's hand. Forced Response: If an opponent succeeds at a story, exhaust Vaporous Isle. Basically this replaces insanity with return-to-hand which is generally a stronger effect. However, it does NOT allow you to affect characters that cannot go insane which is a common issue for Hastur insanity decks. If it could do that it would be a powerful card indeed!